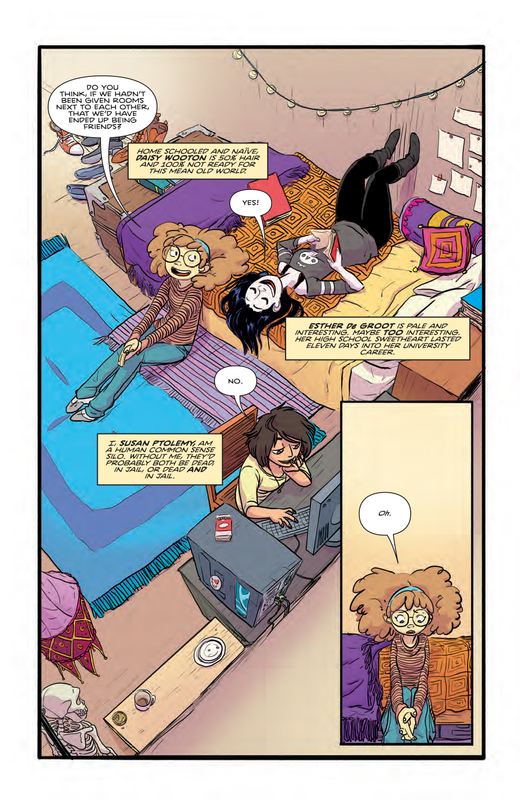 With nearly two decades and three beloved ongoing strips under his belt, prolific web cartoonist John (Bad Machinery) Allison has turned his attention to Giant Days, his first work to debut in print. Out this week from the experimental BOOM! Box imprint of BOOM! 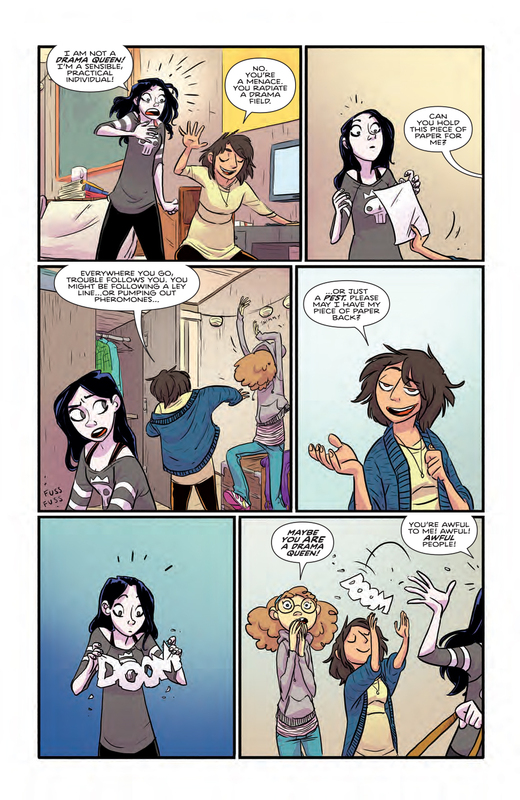 Studios, Giant Days is a sweet, grounded story of three new friends adjusting to college life. While that description sounds like a bit of an outlier in a monthly comic scene full of superheroes and alien monsters, the sensitive, inclusive and funny storytelling, brought to life by artist Lissa Treiman, offers a perfect fit for BOOM!’s diverse slate of offerings. Paste spoke to the U.K.-based creator over Skype to discuss the challenges of monthly comics, keeping nearly 20 years of your own storytelling history straight and what draws him to write younger characters. Paste: Giant Days is pretty unique as far as monthly comics go in the American market—character-focused drama/comedies are much more common online or in manga, it seems. 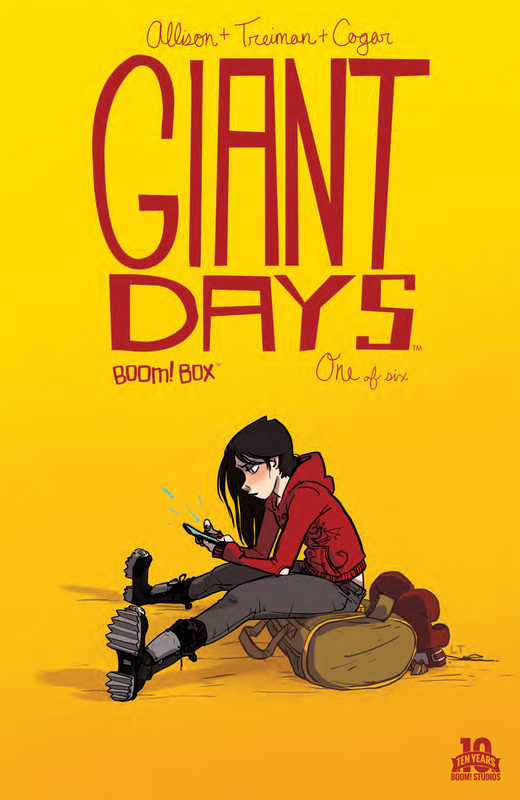 How did Giant Days find a home at BOOM!? John Allison: Well, I had done three issues myself. First I just put them up on the website, and then I made three floppies. I enjoyed writing and drawing the series as much as I did anything else, but I didn’t have time to do that and my ongoing stuff. I had met Shannon [Watters] from BOOM! at a couple of cons, and I remember one event where she was on crutches, and she almost fell over and I caught her. [Laughs] I trust Shannon would do that for me as well in the opposite circumstance. I figured I had some sway now that I had caught her, so I thought, I’ll have a go at pitching this. I’ll just be the writer so it cuts down on my workload. And I pitched it to BOOM! They had just started BOOM! Box and Ryan North was doing The Midas Flesh and there was Lumberjanes as well, these sort of esoteric titles. I thought that maybe that kind of esoterica was an invitation for me to have a go, and they said yes. Paste: Is the new series the first time your work has debuted in print as opposed to going from digital to physical? Allison: I think so, yes. You know, it’s funny I’ve been doing this for so long, for about 20 years, my whole chronology, that I don’t often think back more than one or two years. But I think so, yes. Paste: Do you think that’s something you’ll pursue again in the future? Do you feel like some stories are better suited to print than to digital? Allison: Can I tell you a secret? When I did this, I looked into it and thought, if I don’t draw it, it’s not going to actually take me that long. And it’s harder than you think it is initially, because when you’re the artist and the writer, you don’t have to explain anything to anybody. It wasn’t as easy as I thought it’d be, but I’d love to do more like this. I had a great time. Just collaborating with other people, because most of my stuff I’ve done on my own. But this is something where I worked with really talented people, and the end result has been better than I could come up with on my own. Who wouldn’t want to do more of that? Paste: You connected with artist Lissa Treiman when she did a guest strip a few years back. Allison: Yes, that must have been 2008? I was blown away by what she did then. Since then, she’s gone on to do a huge amount of work for Disney and her own comics, which are incredible. She has a very popular Tumblr. So when I mentioned on Twitter that I was interested in doing Giant Days, she was the first person to contact me. And I played it cool, you know. [Laughs] “Well, you know, maybe.” Tried not to bite her hand off immediately. Paste: You mentioned that working with an artist is a bit different, having to explain yourself. How closely were you able to work together with Lissa on the book? Allison: Well, Lissa can draw anything. As a storyboard artist, you have to be able to draw anything. So I know pretty much anything I write down in the script, she’ll be able to have a good go at. And being an artist, I’m respectful of the fact that you have to be careful about some things as well. There are things I wouldn’t like if I were asked to draw. So I said to her, what do you not want to draw? And she said, “Don’t give me too many cars to draw.” [Laughs]. Which is fair enough really. Cars are a fairly unpleasant thing to have to draw. Not too many cars, not too many horses, not too many bicycles. And I handed the script over, and thus far, what she has produced has been far and away better than what I imagined. Paste: You recently published a blog post about keeping your own continuity straight over more than a decade of publishing within the same universe of characters. Is that something you were particularly conscious of when you were scripting the BOOM! mini-series? Allison: No, in fact, kind of the opposite was true. Because I did those three [self-published] issues, I knew I had to be cognizant of A. the people who’d read them and B. the people who hadn’t read them, as it’ll probably be an equal split in people who come to read [the new series]. I knew I had to neatly file that continuity away. And you know, when there’re only three issues, you don’t have to worry too much. There’re only 60, 70 pages of material I had to be cognizant of. I’m always worried about my continuity because I know I can’t keep track of it. I don’t keep notes of characters’ names; there’s no show bible. I just kind of hold it in the fallible human memory with fingers crossed and a hope for the best. I’ve never really had an editor before. I have an editor on eBooks, but they’re very much republishing stuff I’ve already done. They’re not really poking at the slumbering animal so to speak, they’re just making sure I spell things right. Sorry, I’ve lost track…yes, continuity. See, I’ve lost my continuity there! I couldn’t even hold it for two minutes. [Laughs] You see the problem? You see why I have to write these introspective blog posts about how I can’t keep track of things? Because I can’t keep track of things. Paste: What has your relationship been like with Shannon and the rest of the editors at BOOM!? Allison: Well, the main editor I deal with is Jasmine Amiri. They’re tremendously helpful. I don’t always take the path that’s clearest. There’ve been times when I’ve handed in a script, and they’ve said, “Why didn’t you do this?” And I have a sort of Stan Laurel moment where I hit myself on the head and think, Why didn’t I do this? They’re really just keeping me on the straight and narrow. I’m also a teacher’s pet and really want to hand in an A paper every day, so I’m really keen that they should look at the script and like it every time. I don’t want to get a B when I hand it in. And thus far I’ve not flunked. I’ve done five of the six issues and I’ve not received a big red X, so I must be doing something right. Paste: Has it been more challenging or freeing to write for long-form comics versus shorter daily or weekly installments on the Internet? Allison: Well, it’s interesting, because I’ve been writing dailies for years and you get set up to write a punch line on every page even if it’s adding up to a bigger story. Writing to a 22-pager, I’ve never had that kind of discipline forced on me before. I did a bit of a test run before I did these issues. I did two comics that were 22 pages each, just to make sure I could fit my sort of sprawling excesses into this neat, very tightly formatted format. And I found that it means I digress less. I have to deliver. You have to get straight down the line and deliver all your points and you’ve got to get out on the last page. Whereas before, I’d get to 22 pages and think, You know, I think there’s another week to this! I can do another four. I can make this up to 26 pages, then up to 30, and I’ll call it a day there because otherwise it’s going to cost too much to print. Those were the considerations. Now it’s like, you’ve got to do 22 pages, otherwise they’ll just say, “You’ve done too many pages.” It’s been a challenge to format like that, but it’s been enjoyable. Doing issue after issue, more and more I felt I was comfortable working in that comic book length. 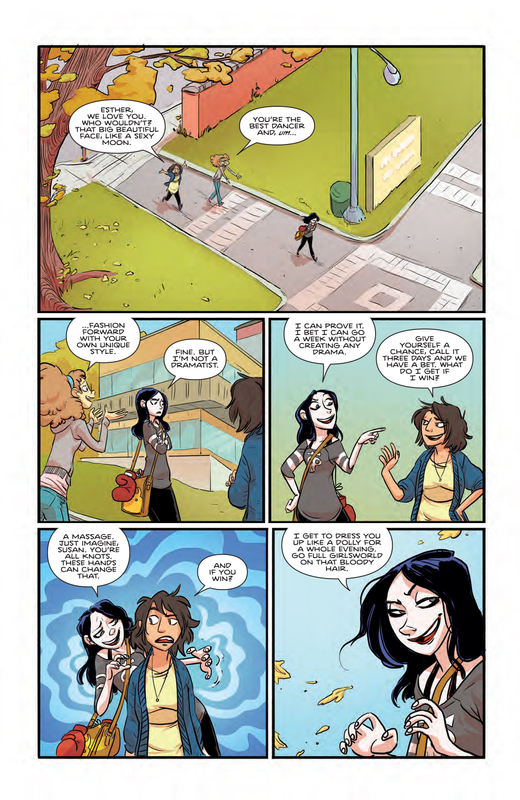 Paste: The three leads of Giant Days are university students Susan, Esther and Daisy. It seems like, at least in the first issue, Susan is going to be our primary viewpoint, but Esther has what the other characters call a “drama field,” where she’s so interesting that essentially everything happens to her. Is this a send-up of YA tropes where one character is a magnet for constant craziness? Allison: I’m not that familiar with YA fiction. I have friends who work at First Second books, and when I was just getting started writing younger characters, they gave me a reading list of books to have a go at. I’ve never really dug that deep into it. As a kid, I went from reading kids books to reading science fiction to reading, you know, adult fiction. There was never any gap. YA was a thing when I was a teenager, but it was a library category, not a marketing category, and you never really felt like it was a huge section. Susan is kind of the lead character, but everyone gets their turn in the series. It’s quite democratic. Everyone is kind of rotated in and out constantly, because it is a series about the friendship of these three characters. You get to see the dynamic in pairs and how they help each other out with things. I’m really interested in how people feel out new friendships, and at the start of college, that’s really important. Paste: Your previous stories are known to slip in and out of paranormal or surreal events fairly seamlessly. Are we going to see that with Giant Days or is this firmly grounded in reality? Allison: I think it’s going to be more firmly grounded in reality. Although I enjoy doing those supernatural stories, there’s something a little bit sloppy about it? It’s kind of like doing a big long guitar solo or drum solo. You can do whatever you want when it’s your band, but sometimes perhaps it’s a bit better to tighten things up a little. And that’s what I was really conscious of here. You’re never going to see a gremlin of some sort here. You’re never going to see a supernatural creature. When I did the first issue of the three that I did by myself, very much feeling it all out, there’s a point where Daisy does some yogic flying. She levitates, and although I thought that was funny, and yogic flying is a real thing (although it’s just sort of bouncing, very aggressive bouncing), I thought, I can’t do that again. So there’s a bit of slop, a little bit of that wild soloing in the original series, but the BOOM! series is much more straight down the line, and I think it’s probably stronger for that. 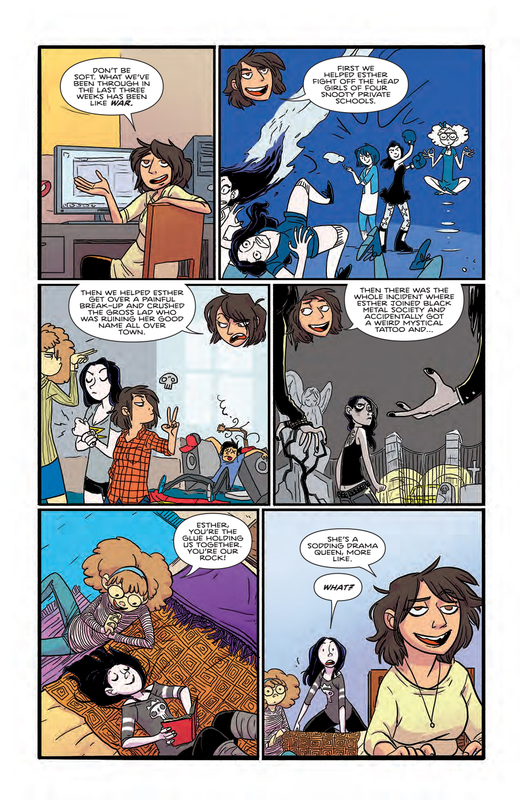 Paste: A lot of your work, including Giant Days, focuses on younger characters. What do you find rewarding or intriguing about writing teen or college-age characters? I can foist all these problems and work through them in an interesting way. When I first started doing the college-age comics, it was very interesting to think through the reactions I’d had when I was that age, how I dealt with things, and the different ways you could deal with things. It adds a level to the writing where you can just enjoy vicariously the pleasure and the pain. Nostalgia is meant to be painful, and I kind of just want to bring across a little of that pain with it. That’s why I enjoy characters of that age. Paste: Given that Giant Days is set at University, would you go back and experience your college years over again if you had the opportunity? Allison: Time travel within my own lifetime, hoping that the next leap will be the leap home, Dr. Samuel Beckett style? If I could go in Samuel Beckett style, knowing what I know now, and just kind of go in like it was a vacation in my 19-year-old body, I think I would. I think it would be fun. But that’s just hindsight, isn’t it? Hindsight is like the greatest gift that none of us will ever experience. The pleasure of hindsight, can you even imagine the fun you’d have? You’d be so wise. But I have to say, though, young people are quite rowdy and I’m quite staid now, so I think the noise would get to me after about a week. I’d be hoping to leap out. I’d be hoping to leap into a cancan dancer or something like that. I’d be begging Al to get me out of there.